and it covers some of what I think I need to understand, but not all. Maybe I should begin here. although this, I think, shows a later version that is not quite the same shape, and was assured that the parts were anyway inseparable, which is true. A couple of years down the line and I've got everything in bits, pleased to think I would re-fit the missing clip and cure a rattle that had been bugging me for a while - one that disappeared immediately as soon as I touched the clutch pedal. However I've discovered that the second clip has gone AWOL too, and that the release fork and the thrust-bearing "ears" are now terribly, terribly worn - i.e. they have completely changed shape. 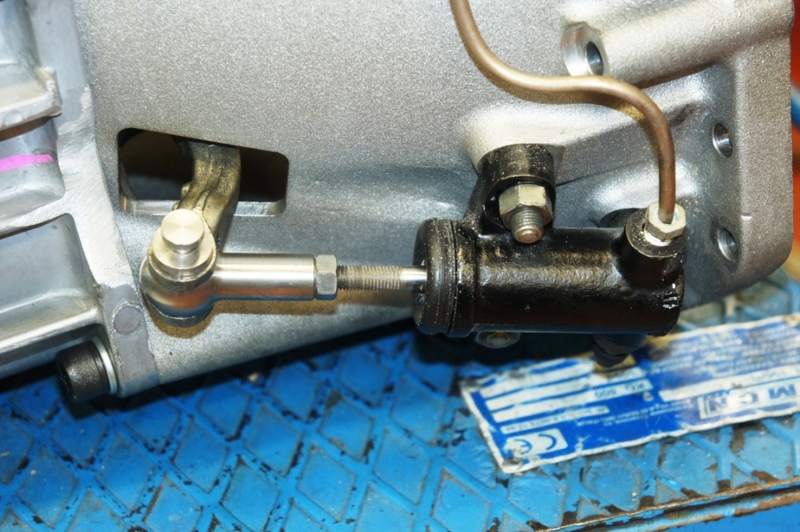 Originally, the machining of the fork-ends prevents the judiciuously ovalised "ears" on the release bearing from passing through the gap unless turned sideways, which means that once assembled these parts cannot inadvertently separate. Now, however, they can separate whatever their attitude. I had imagined the clips were just to quieten things down, but maybe they did more than that ? The bell-housing is part of the brilliant Cangialosi 5-Speed (believe there are supply issues again ?) and the relative positions and geometry of the thrust bearing and fork look logical and perfectly centred, thrust contact being plausibly obtained mid-slot and at optimum centre-position in relation to the gearbox shaft etc so I don't believe this to be relevant. The thrust-faces look normal, properly cented in the clutch assembly ? So that's the first part of my question - has anyone had anything like that happen to them ? The second part relates to clutch-type. 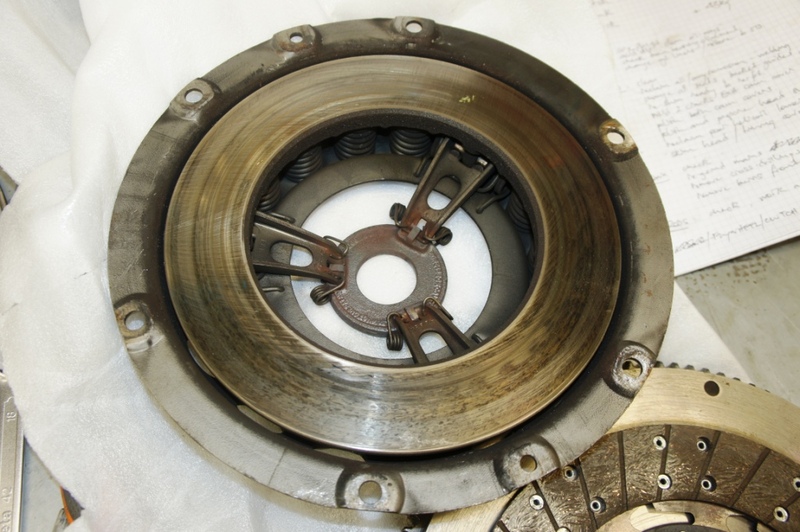 I believe this is the correct 10" original clutch referred to as the "spring" type as against the later diaphragm. Is there any improvement in the clutch behaviour or its strength in going for the later diaphragm type (which I understand is 9.5") and what parts exactly does one need to change and modify please ? I had always found that - rattle aside - the clutch was excellent as it was. I am actually reassured to see the galling and uneven wear, on the flywheel surface at least, as I initially and briefly suffered bad judder when I first fitted the 5-speed and regretted very much at the time not having had the flywheel refurfaced - whereas this can now be done properly at Chesman Engineering at the same time as they have my crank. Last edited by rfs1957 on Tue Apr 24, 2018 8:53 pm, edited 3 times in total. I changed from the coil spring type clutch to the diaphragm design on my 3.8 as part of an all synchro transmission conversion. 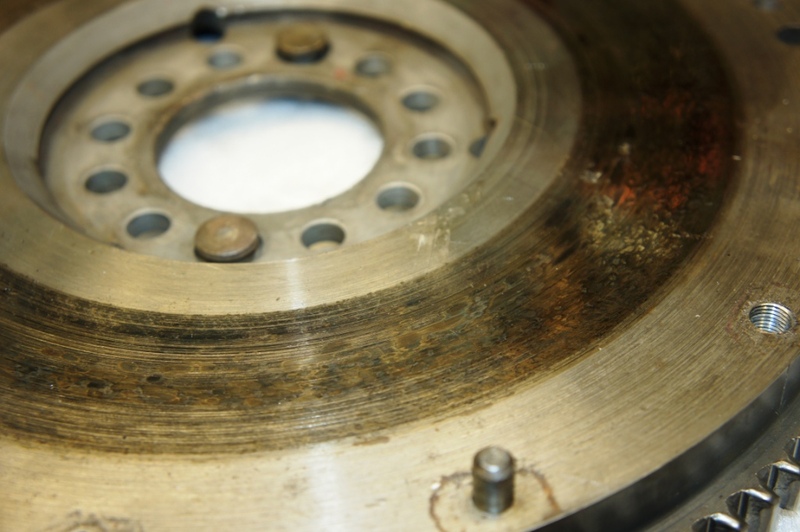 The release bearing must be changed to the corresponding part number to compensate for the different thickness of the clutch cover (height of the bearing surface on the cover to the face of the flywhee). The other components remained the same. It works fine. The flywheel on my '64 3.8 flywheel had to be drilled for the 9.5" diaphragm clutch. Thanks Eric - did you have to change, or choose to change ? And if you chose, what makes the diaphragm type better, please ? They're stronger with more clamping force and less likely to break. Having said that I stayed with the 10" clutch on my 3.8 when I fitted a JT5 box. 1500 miles and ok so far although I know that doesn't mean a lot. Those clutch fork retainer springs don't look right to me; they're not like any others I've seen. I had read the same things noted by Andrew, and a spare rebuilt B&B diaphragm unit happened to be included with the (inoperative) car. I know that Jaguar were switching vendors and clutch types in '64 as noted in the shop manual. Some late 3.8 flywheels were drilled with both bolt patterns. That said, I have no first hand experience with the coil spring clutch. I did note that the surface of the flywheel looked like yours when I took it apart (1985)...and there was what appeared to be a recently rebuilt coil spring clutch attached. Thanks Ralph, that is most useful regarding diameters and types. Still none the wiser about the funny wear I've got on the forks and the ears on the carbon thrust. I wondered if I had lost the first clip through my poor fitting (or faulty clip ?) and that this provoked wear and rattling on one side, which then in turn cocked or imbalanced the thrust off to one side and provoked the loss of the second clip, which than added its wear and rattle ............. it's all a bit far-fetched though. It sounds like nobody ever has any issues with this. 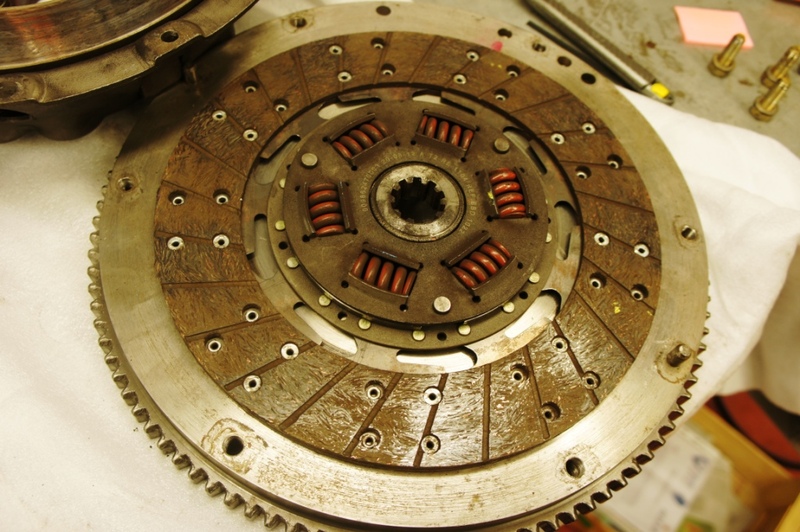 One thing that's still not clear to me ; if you go for a diaphragm type clutch, do you chuck away the whole 10" cake-mould with its thrust bearing, fingers, springs etc and splined clutch plate, and fit a 9.5" diaphragm equivalent ? Isn't that an expensive solution to a non-existant problem, if your 10" spring version works fine ? Could somebody send me a link to the cost ? Plus cost of drilling and balancing the flywheel. The 9.5 is lighter to the leg on usage. Pretty obvious wasn't it ! Thanks a lot. But presumably I need differnt splines for the T5 gearbox shaft on the 9.5" disc - think I saw mention of this earlier in the other thread, will try and do the homework myself this time. Yes spline numbers are different. Medatronics supply an appropriate friction plate with the box. You need the 9.5" clutch plate because, I believe, there are no 10" plates available with splines to match the T5 box. You can use the 9.5" friction plate with the 10" pressure plate though. This is the set up I have. 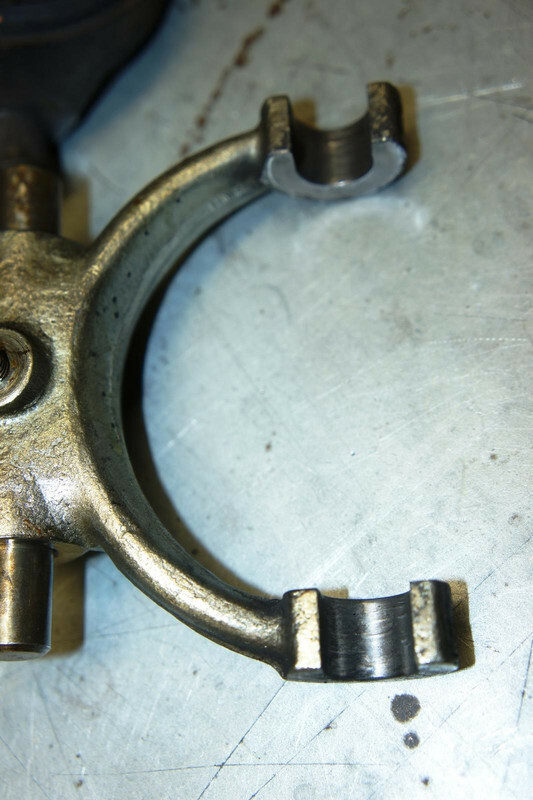 Don't forget you need a different oilite bush in the crank end to suit the T5 first motion shaft. Thanks for that. 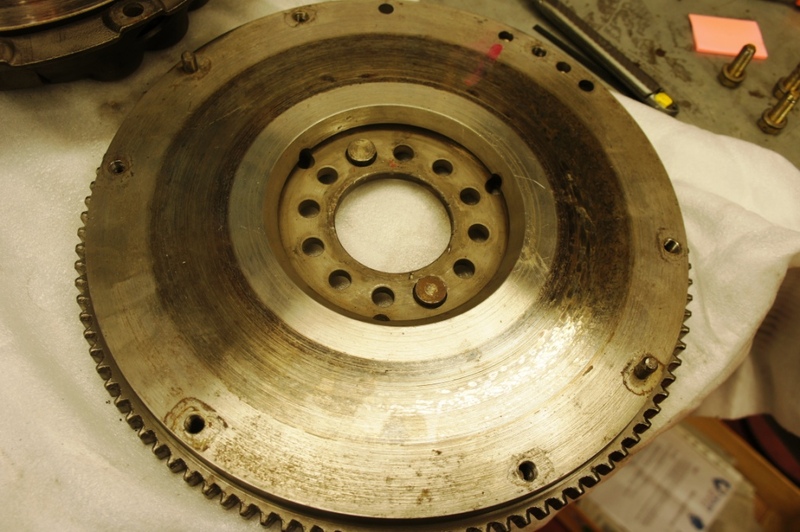 Cangialosi in fact supplies the correctly splined 10" clutch-plate with his T5 gearbox. 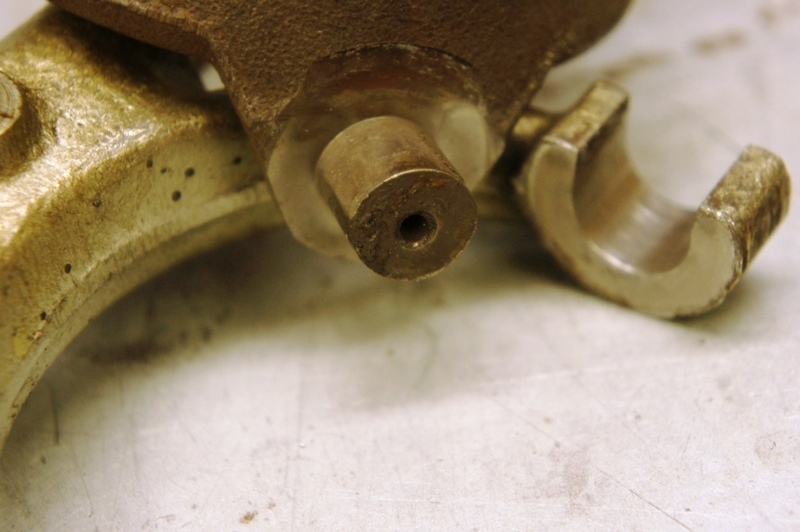 However I have no recollection of re-bushing the crank tail to suit the T5 shaft nose, which I think means that the shaft is supplied already at the standard Jaguar bush size. As I haven't got access to my crank for a while, could someone be so kind as to confirm what that standard size bore is ? I can't see the info in the manual. I've just measured my input shaft diameter at 12.49mm. While I'm at it, has anyone got a good genuine release-bearing fork they'd sell me ? These parts don't seem to wear (only on my car !) so there may be a stock of these in someone's "magic-box" ? Last edited by rfs1957 on Tue Apr 24, 2018 8:51 pm, edited 2 times in total. 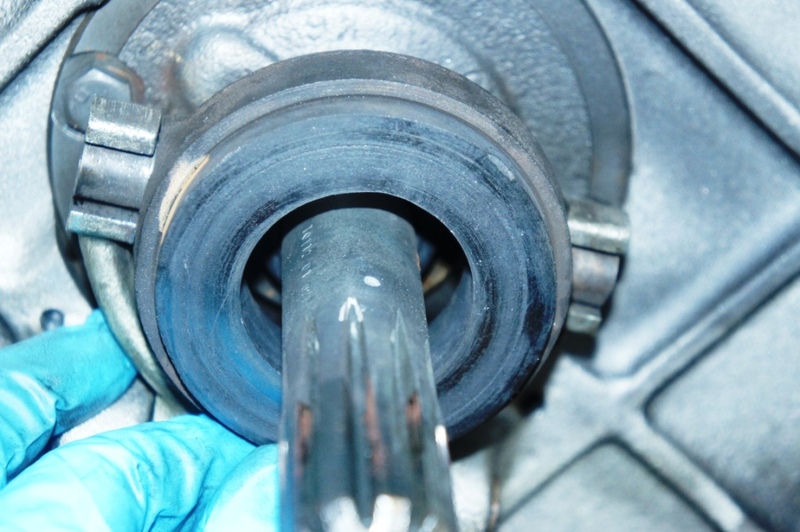 I've never seen ovalised release bearing ears or worn fork ends, but then I've never seen such a dry assembly. I'm not surprised things wore badly in a car that does significant mileage. 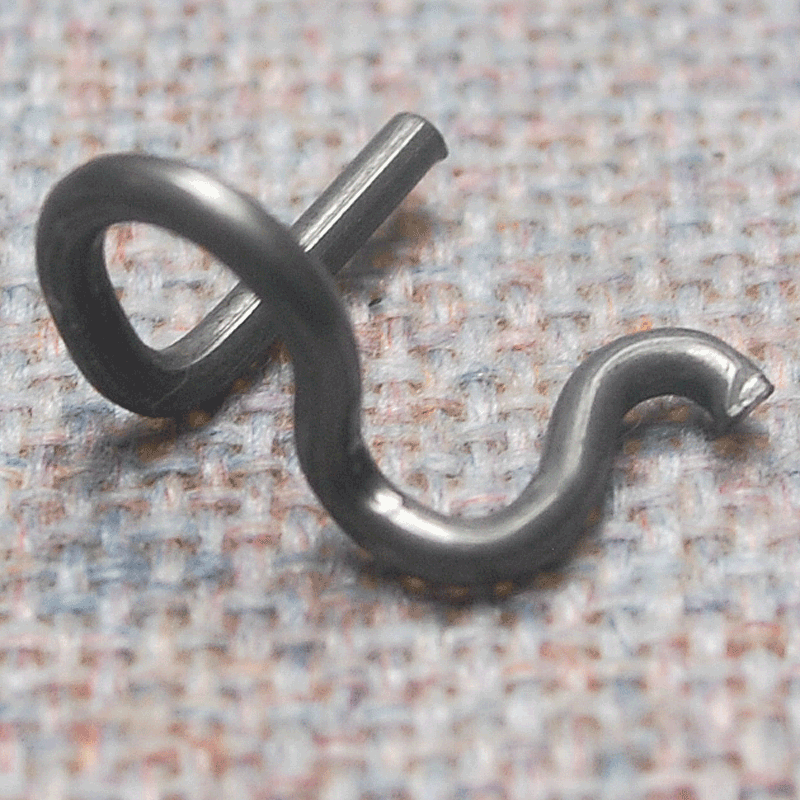 The clips I've seen are like the one shown late in the thread where there are two parallel pins - one down the centre of the release ears and the other clamping it lightly to the fork ends. I'd guess the clips are to avoid rattle and avoid passive light rubbing wear of the carbon face against the pressure plate release platform, through not being pulled off by the released clutch fork? The diaphragm clutch, as Ralph said, is lighter on the left leg. The diaphragm has a slight over-centre release geometry, unlike the coil spring which just gets heavier the further you compress the coils. There are also more parts, so it's no mystery why diaphragm clutches are effectively universal these days. FWIW all but one case of judder I've come across were on coil spring clutches. I'd never fit one these days. About time you were back Crespin. The ears were really well greased when they started, and they've only done about 10K km. However, once I stick a diaphragm clutch in, and a pile of new parts around the release, we'll never know and can all draw our own conclusions. Point taken about the over-centre fall-off of effort, sounds much nicer. Ever try a 205 GTi ? Felt like you were winding up a torsion bar, horrible. 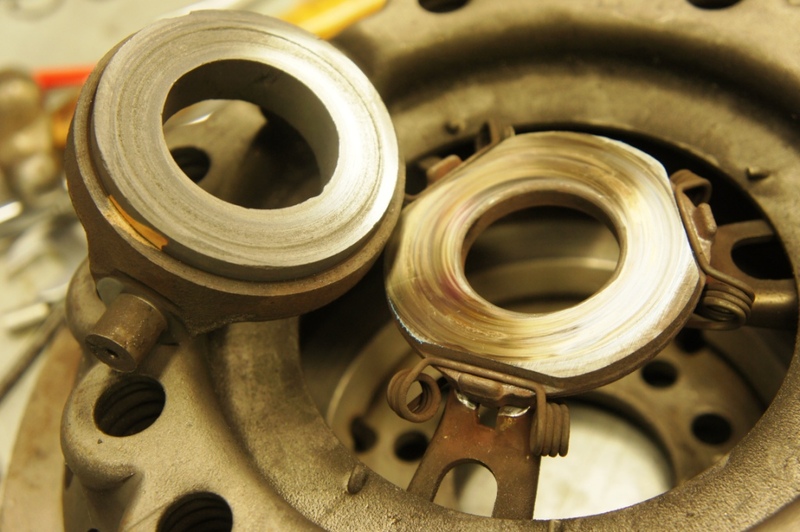 Another benefit of a lighter clutch is less pressure on the rear crankshaft thrust washer, which will accordingly last longer and help maintain end float within specs. With our typical annual mileages the difference in engine longevity may not be too significant but my next clutch will be a diaphragm type. With regard to the spring clip for the release bearing, your second photo and the SNG C22479 are correct. The XKs version may be an alternative but it does look odd. The clips are important as they secure the release bearing pivots tightly against the fork while allowing some rotation as the fork pivots. 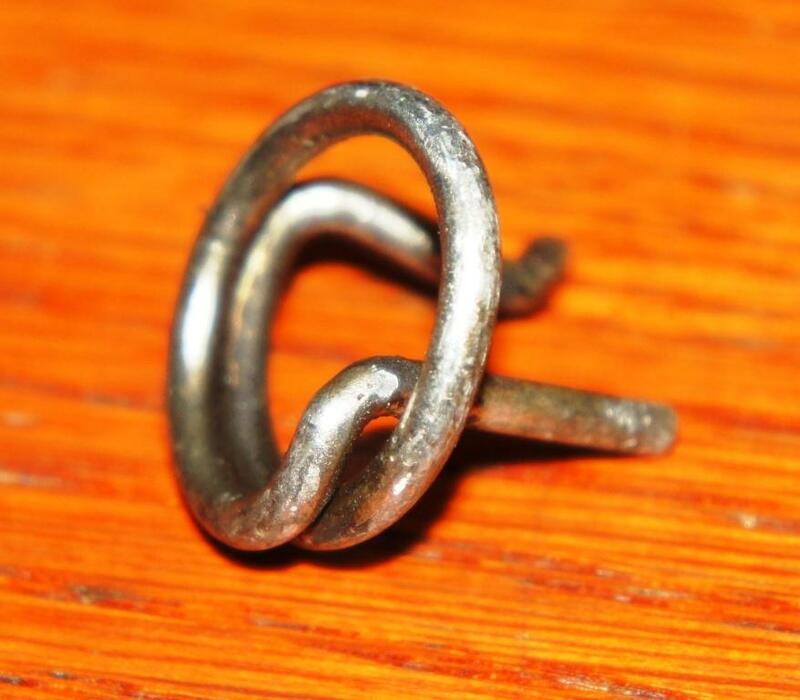 Missing clips will lead to vibration and accelerated wear which can result in what you discovered. The Haynes manual has a section on release bearing replacement which includes several murky photos but a good written description. Clutch choices available for your Tremec will govern, and mixing a 9 1/2" driven plate and 10" cover plate may be ok, but I would recommend replacing the lot while you're in there. As noted by others, for stock transmissions there are 2 release bearing type suiting either spring or diaphragm clutch covers and the wrong one won't work. The pilot bearing will be to imperial specs, and my SNG replacement measures .500 ID, .752 OD and 1.056 in length. .500 is 12.7 mm so your 12.49 mm. nose sounds about right. If you’re looking for a 9.5” friction plate then the item I purchased for my T5, back in 2010 is from AP Racing and has part number CP2346-4. It seems to have increased in price considerably in the intervening 8 years but there seems to be another plate with identical spec, a little cheaper, under the number CP2346-45. The only difference seems to be that the latter has “low crimp spring centre”. Both seem to fit TVRs and Cosworths so should fit our cars. My pressure plate and bearing were Jaguar equivalent under the part number HK9702Q. My T5 gearbox is paired with the 9.5” diaphragm clutch. The clutch plate is 9.5" 23-spline to fit Ford V6 (Granada, Scorpio) and Rover SD1 V8, such as National #NHB3381. Not sure this applies Bob. I believe diaphragm clutches grip more tightly. 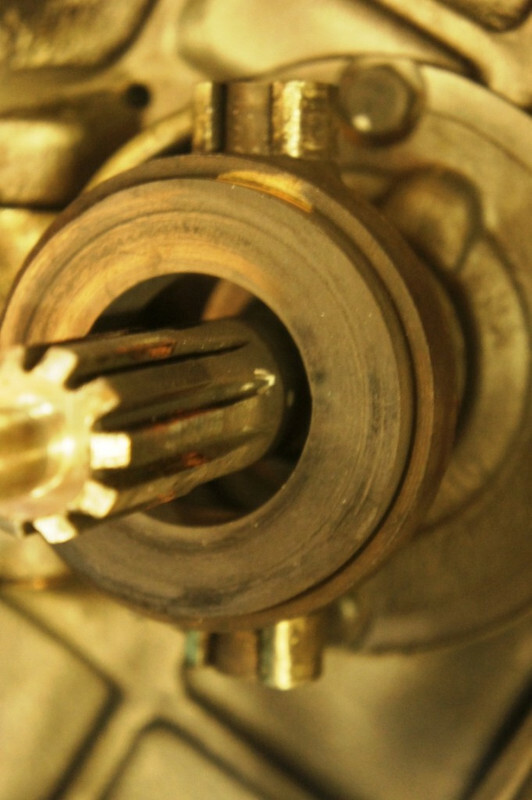 At the risk of going well beyond any real knowledge of engineering, the pressure on the thrust bearing depends on the force required to ‘unclamp’ the pressure plate. 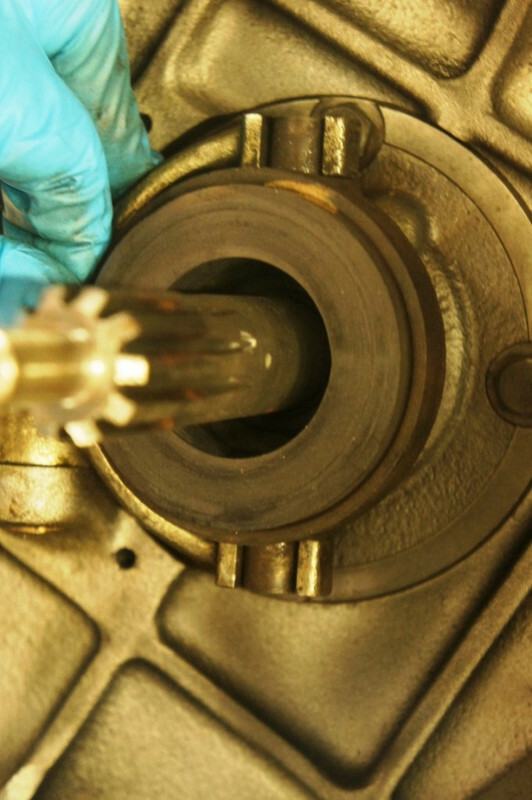 That action can feel light or heavy for the same or greater clamping load/thrust bearing wear, depending on whatever mechanical advantage is available from the release mechanism. I could believe a heavier load on the thrust bearing despite a lighter feel on the pedal (with a difference in distance moved, of course). 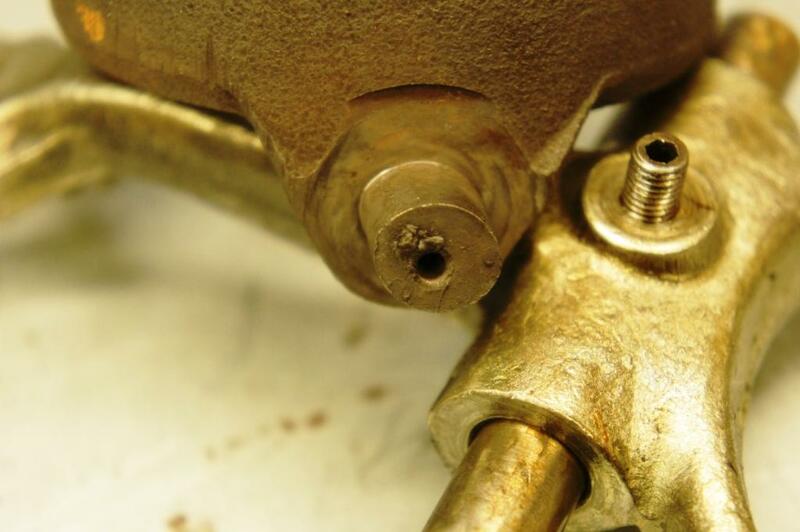 Moving a lever could feel light or heavy depending on design, even if the load on the other side of the pivot, or the wear on the pivot itself, is no different. 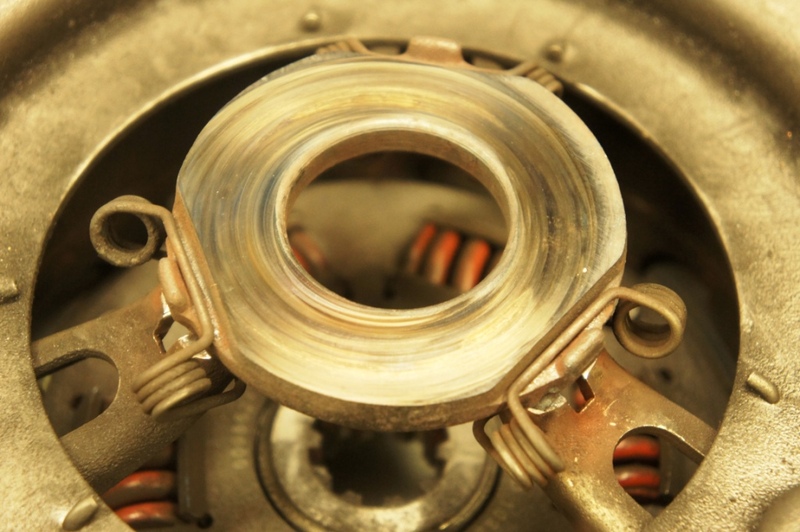 One could even imagine a perverse scenario where a lighter pedal effort led to greater thrust wear by encouraging drivers to ride the clutch more comfortably for longer periods. 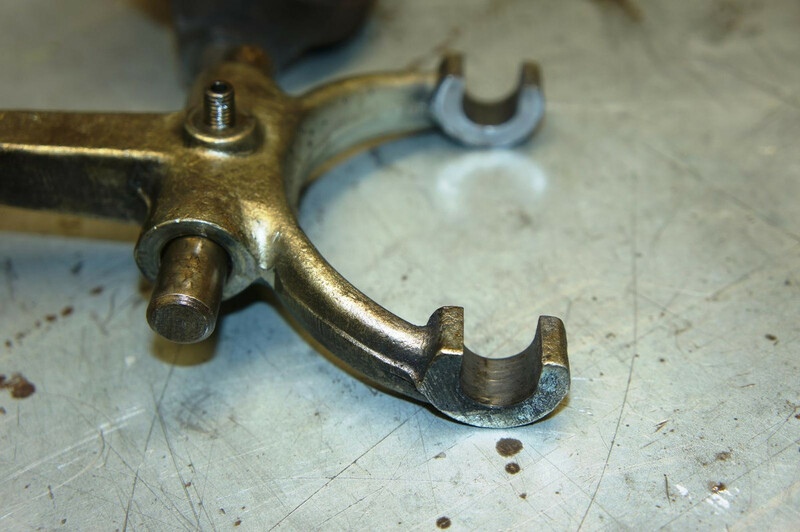 For similar hydraulic ratios, ie unchanged master - slave, a lighter pedal equals less effort on the thrust bearing and less wear on the crank thrust washer. Reductio ad Absurdam is - as usual - the best guide : a clutch with no springs equals no effort at the pedal. Re clutch-plates, puzzled by the "23-spline" referred to somewhere here ? Erreur de frappe or correct ? Cangialosi's box has a 10-spline "Ford-style" (I quote) 1 - 1/16" shaft, as compared with the original 10-spline 1 - 1/8" Jaguar shaft.